Settled near Doyle Spring (later known as Hopewell Spring) in 1775 with Joseph Houston’s Station and originally chartered in 1789 as Hopewell, Virginia, 250 acres at the Bourbon County Courthouse, which was completed October 1787, were ordered laid off into town lots and streets by the Virginia Legislature at the request of the citizens. The town was probably named for Hopewell, New Jersey, hometown of Lawrence Protzman, the proprietor of the land on which the lots were laid out. Protzman had purchased the land from John Reed. James Garrard, Bourbon County’s Representative on the Virginia Legislature, petitioned to change the name to Paris in 1790. Bourbon County, formed 1785 from Fayette County, and its county seat were named for the French city and the Bourbon line of kings out of gratitude to the French for their assistance during the Revolutionary War. On June 1, 1792, Kentucky was admitted to the Union as the fifteenth state and in 1794 the first post office opened as Bourbonton. It was renamed Paris by 1815. The town and Post office both have been referred to as Bourbonton and Bourbon Courthouse. 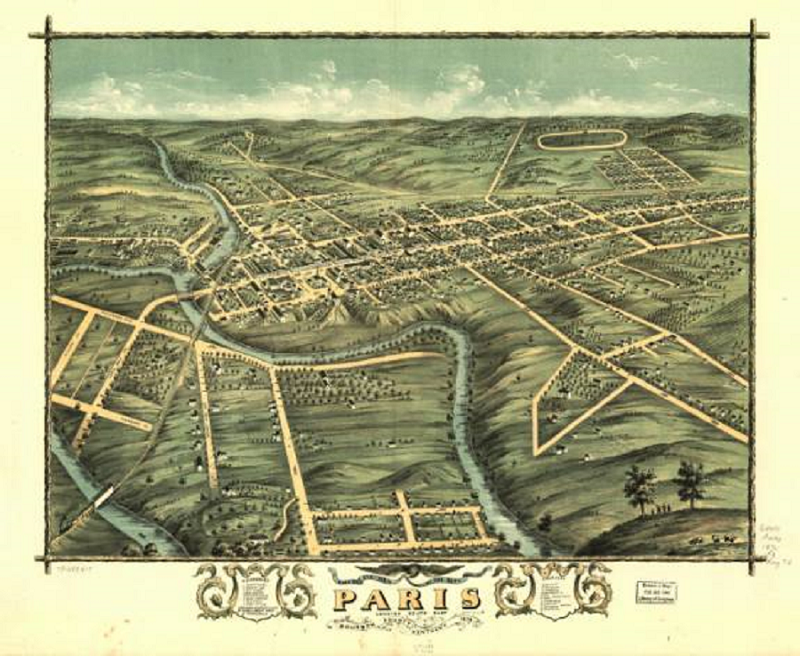 Paris was formally chartered by the Kentucky State Legislature in 1862 and Maj. George W. Williams, 1812 war hero, was elected as the town’s first Mayor on April 5, 1862. The petition for the establishment of Hopewell by the citizens of Bourbon County was signed September 2, 1789 and sent to the Virginia Legislature as follows: To the Honorable the Virginia Assembly: “The petition of the Inhabitants of Bourbon County sheweth that the land whereon our present Courthouse now stands to the amount of two hundred and fifty acres is laid off in lots by the Proprietor, for the purpose of settling a town which lots are principally bought up by those who are now living on and improving them and have erected a number of very convenient buildings on said lots, we your petitioners conceiving it necessary that saidd town be established by law pray your Honorable body that a law pass for the establishment of a town agreeable to the manner the lots are now laid off and that trustees be appointed for the purpose of superintending and regulating of the building of said town and in duty Bound we pray.” PETITION NO. 2277, ARCHIVE DEPT., VIRGINIA STATE LIBRARY, pp. 18-20. The response of the Virginia Legislature was: "Be it enacted, That two hundred and fifty acres of land, at the Court House in Bourbon county, as are laid off into town lots and streets by Lawrence Protzman, the proprietor thereof, shall be established a town by the name of Hopewell, and that Notley Conn, Charles Smith Jr., John Edwards, James Garrard, Edward Waller, Thomas West, James Lanier, James Littell and James Duncan, gentlemen, are hereby constituted trustees thereof." The earliest record of the land on which Paris, Kentucky, stands was uncovered in an old suit over a military grant to one Walter Stewart for service as a sergeant in his Majesty's 44th Regiment of foot and agreeable to the Royal Proclamation of 1763, for 200 acres in Fincastle (later Bourbon) County. Col. John Floyd, who was the principal surveyor of the Transylvania Company and delegate to the Assembly that met at Boonsborough May 24, 1775, to make laws for the infant colony, acting as deputy surveyor to William Preston of Fincastle, surveyed this grant for Stewart in 1776. He made his first location immediately in front of what is now the entrance to the old Duncan Home (Burr House) on a tree in the then wilderness. Overlapping land was preempted by John Reed of Maryland, James Galloway, and Samuel Lyon, who claimed as heir of Daniel Lyon. The settling of Bourbon County by the early pioneers, John Hinkson, Joseph Houston, John Grant, George and Isaac Ruddell, John and James Cooper, John Martin, Robert Clarke, Dr. Henry Clay, Thomas Kennedy, Robert Sconce, William McConnell, James Sodowski, Samuel Curtwright, William Thomas, Henry Wilson and John Miller, among others, paved the way for Paris to become an important part of early Kentucky. James Garrard served two terms as Kentucky’s first governor and John Edwards served as U.S. Senator from Kentucky. Leaders of the community during Paris’ early years as part of Virginia were Benjamin Harrison, Bourbon County’s first Sheriff, county attorney John Allen, James Garrard and his son William, court clerk John Edwards and his son Haden, Thomas Swearingen, John Hinkson, Thomas Waring, Edward Waller, Edmond Mountjoy, and John Gregg. After statehood others joined the ranks; James Duncan, William Griffith, Nathaniel Rogers and Thomas Arnold were but a few. In 1797, famed builder Thomas Metcalfe laid the first foundation stone as construction of a new courthouse began on the town square, which was occupied the following year. It replaced the log cabin structure that had burned down. While most of the large homes were of brick and stone construction, log cabins and frame homes were plentiful. Builders used oak and hackberry lumber for exteriors and ash for flooring. Cherry and walnut were used for furniture, cabinetry and paneling. By 1808, Isaac Hall operated a brick kiln in Paris. By 1810 Paris had 838 residents and 1217 in 1830. William Holmes McGuffey taught school on High Street from 1823 to 1826 before joining the faculty at Miami University. Despite the anti-slavery movement in Paris and Bourbon County, by 1850 the number of slaves totaled more than half of the county population. It would take war to finally bring an end to the practice of slavery. The majority of citizens in the county sided with the Union as war broke out in 1861. Initially the war was not about slavery, but monetary in nature. The southern plantation owners and businessmen felt shortchanged by the northerners; purchasing southern goods and crops at low prices and reselling them in the north for huge profits. These same men, demanding fair treatment and better prices, were using slave labor to harvest their crops and process the raw materials. Perhaps Lincoln, too, sensed the irony of the situation as he issued the Emancipation Proclamation, thus ending a brutal practice that still haunts this nation a century and a half later. Former Congressman William E. Simms enlisted in the southern cause and urged others to join him. First, as a Colonel in the Kentucky militia, and then serving two terms as Kentucky’s Representative in the Confederate Congress and as a member of Kentucky native Jefferson Davis’ cabinet. There were three Home Guard units in Bourbon County during the war; the Bourbon Rangers, the Flat Rock Grays and the Hamilton Guards. The Rangers were from North Middletown and commissioned on May 12, 1860. Officers were Capt. James W. Stivers, 1st Lt. J. T. Harris, 2nd Lt. H. C. Hutchcraft and 3rd Lt. J. B. Stivers. The Grays of Flat Rock were commissioned May 19, 1860. Officers were Capt. W. P. Bramblette, 1st Lt. H. T. Wilson, 2nd Lt. N. W. Tonle and 3rd Lt. J. T. DeJarnett. The Hamilton Guards of Paris were commissioned May 20, 1861. Officers were Capt. John S. Hope, 1st Lt. Ben W. Buckner, 2nd Lt. Samuel B. Hawes and 3rd Lt. L. Towles. They were commanded by Maj. H. M. McDowell who was commissioned June 23, 1860 by the Kemtucky State Guard. Morgan’s Raiders, commanded by then Colonel John Hunt Morgan with Bourbon County native Richard M. Gano, Basil Duke and A. A. Hunt, forced Capt. Hugh Brent and his men to surrender and occupied Paris on July 18, 1862 but were driven out four days later by the 9th Pennsylvania Cavalry Regiment, the 13th Indiana Independent Cavalry, Capt. David E. Pugsley’s E Company of the 18th Kentucky Infantry and several detachments from nearby. The Raiders captured Paris in the night and plundered the town the following morning taking clothes, horses and guns. Raider tactics were to retreat at the first sign of Federal troops and Duke’s 2nd Kentucky Cavalry, Gano’s Texas Brigade and Hunt’s 1st Georgia Rangers removed from Paris without much of a fight. The Raiders would return to Paris in mid September and again occupy the town, this time for seven weeks. Upon their being driven out by union forces, the Federal troops commandeered Kentucky’s Provisional Confederate Governor Richard Hawes’ home on Pleasant Street, turning it into a Union hospital. The 45th Ohio Volunteer Infantry encamped in Paris at the fairgrounds in anticipation of further Rebel attacks. The 18th Kentucky Infantry replaced the 45th Ohio and remained in Paris until December 5th when it moved to Lexington. In 1863 there were skirmishes near Paris on Match 11 and April 16, 1863. On July 29, the Confederates attacked Winchester and Union forces repelled them in route to Paris. There would be no more major skirmishes near Paris for the duration of the war. The Union Army, including the 40th Kentucky Volunteer Mounted Infantry, remained in and around Paris until April 1864. Morgan’s last raid into Kentucky saw the capture of Mount Sterling on July 8, Lexington on the 10th and Cynthiana on the 11th, but there were no affairs at Paris as the Federals were in pursuit of the Rebels who did not stay long in the area.